On the trail for Oysters mushrooms and if I am lucky, maybe morels! Took a stroll Sunday afternoon up Chapman Creek to see if the oysters are out yet. If you have been following me this spring you will remember I found a huge flush about three weeks ago. I thought that the season had begun, but no such luck since that early find. I was just wondering today if it was in fact a very late winter flush rather than an early flush? Either way it was a good find a Chris made a wonderful pasta dish with them. It has also been rather dry this spring. We have had a couple of rain events, but the woods are still pretty dry. Usually most trals this time of year are wet and muddy, but not so much this year. 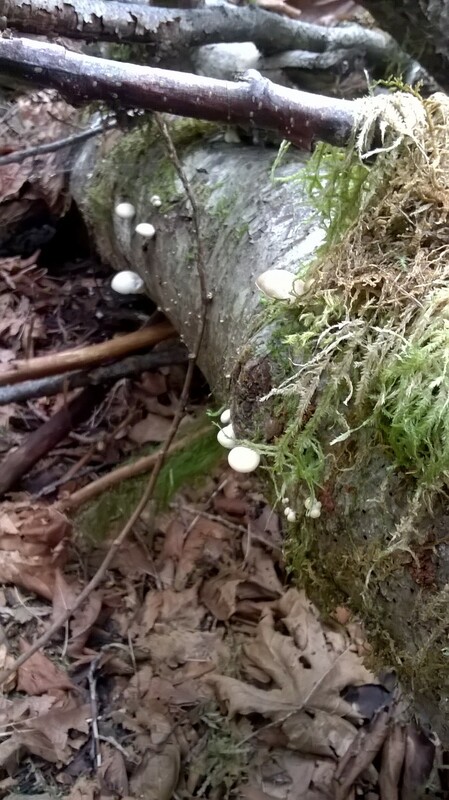 Today I saw only two trees that had some very young oyster mushroom pins on them, but the a area looks like it could be a potentially very good area. 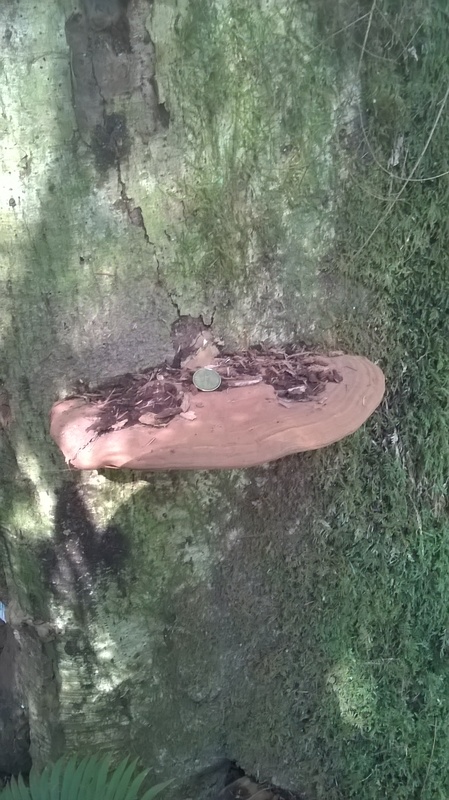 What I saw quite a lot of were ganoderma applanatum, or the artist’s conk. If anyone is looking for young, fresh medicinal polypores , then head down this trail. It is the lower Chapman Creek trail, that starts just off the highway, on the west side of the bridge that crosses Chapman Creek. 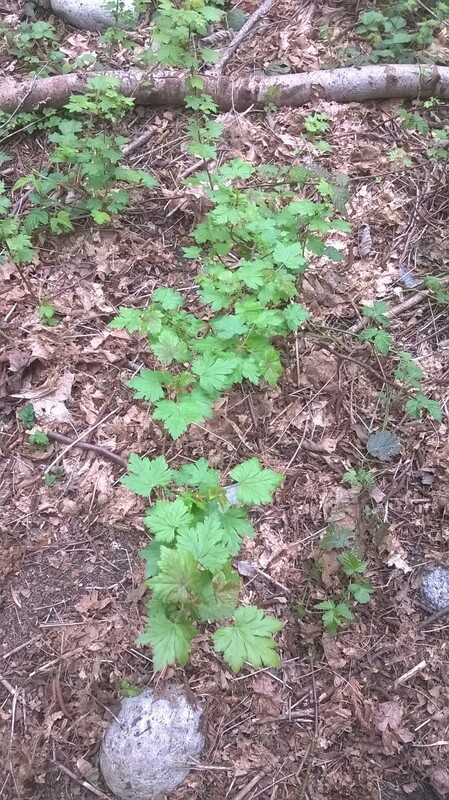 What I did find was a nice patch of currants. I have a copy of Duane Sept’s book….“Wild Berries of the North West“. I found a patch of Red Flowering Currants last summer, but in his book he describes them as “edible, but far from incredible”. There are however, several varieties and until they blossom and bear fruit, I will not be able to do a positive ID. I will let yo know later what they were. 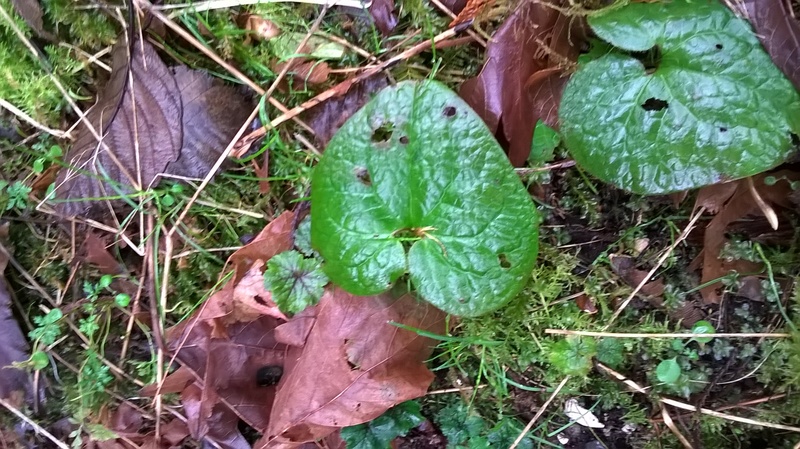 I also found two patches of what could be wild ginger, or maybe not. When I plucked one up and scraped at the root, it didn’t smell or taste like the ones we found earlier in February when Chris and I went out with one of our wild forager friends, Sarah. 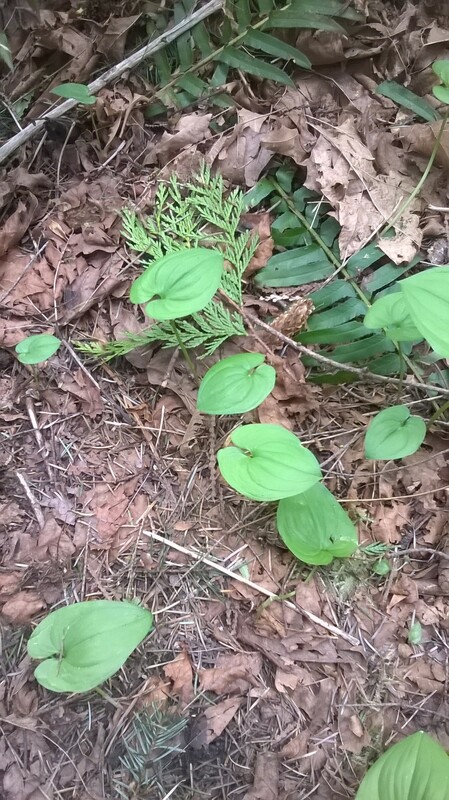 The first picture is of the wild ginger, the second one looks similar…but I am not 100% sure. I guess I will have to take Sarah out to this patch and ask her what she thinks. That’s it for now, just waiting on the spring rains and the weather to warm up some. I know that some of my friends have had luck this spring finding morels, so if you have had any luck send me a post and a couple of pictures and I will put them in my next post. 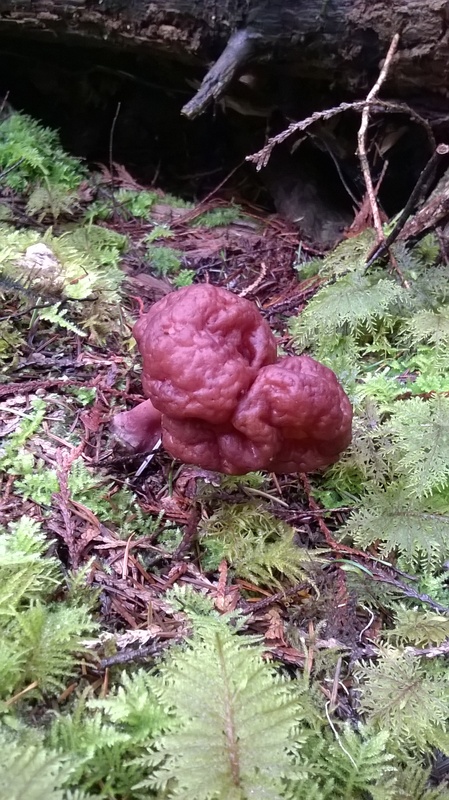 Hope to see you on the trails some times Coastalshroomer. I did a short solo foray today in the hopes of getting some early spring oyster mushrooms, but alas, there were none to be had. I guess those ones that I found about three weeks ago were a fluke, as I have not seen much since them. Mind you, I did find a couple of very small ones this Monday up Cliff Gilker park. However they were in a very wet area, and where I went today up along Chapman Creek, it was pretty dry for this time of year. Back to the foray today, what I did find were a number of young fiddle heads. 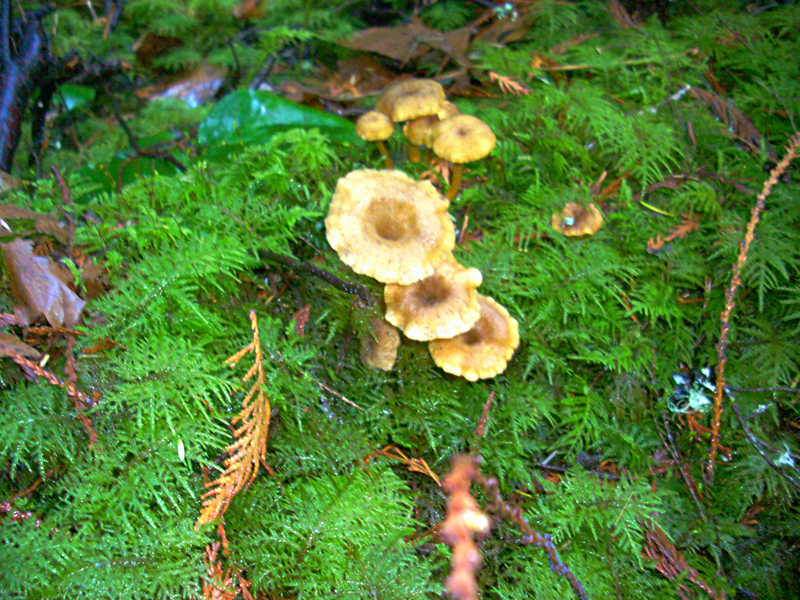 They are also know as Brake fern,eagle fern, pasture brake. I myself have never eaten these, but they were a traditional early spring wild vegetable that was eaten by the first nations people. In one of my older field guides “Guide to Common Edible Plants of British Columbia” published by the British Columbia Provincial Museum, written by A F. Szczawinski and George A. Hardy. 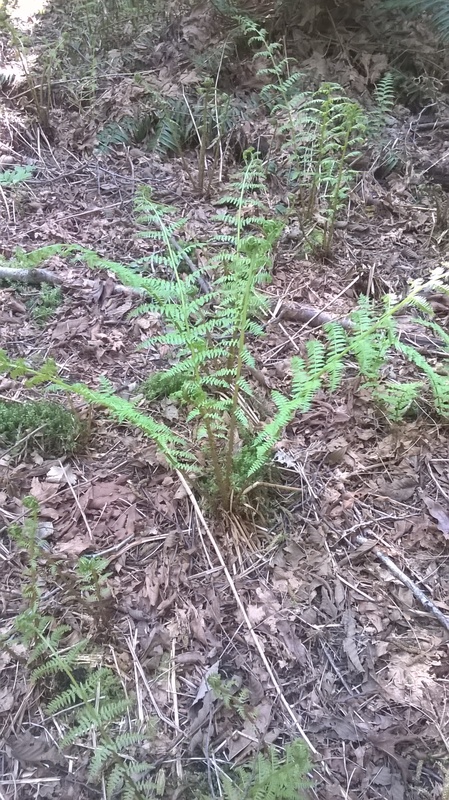 In that book, they state that this is an edible fern. However, in a recent book by Duane Sept titled “Edible & Medicinal Plants of the Northwest”, he warns against eating it, as it has been found to have a carcinogenic substance that can cause stomach cancers. Doing a search of the internet comes up with the same caution. So what to do??? One commentator stated that eating charbroiled hamburgers are also carcinogenic….as well as likely a number of other substance, including alcohol!!!! 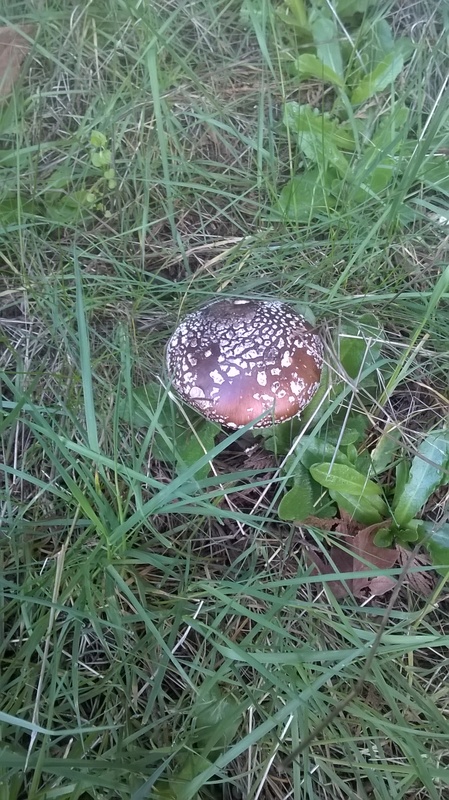 Unless you are 100% sure of the identification of the mushroom or any wild foraged plant, don’t consume it. Fiddle heads are said to have a delicate taste, similar to asparagus….I have a bunch of asparagus in the fridge, which I know is edible and also very tasty. 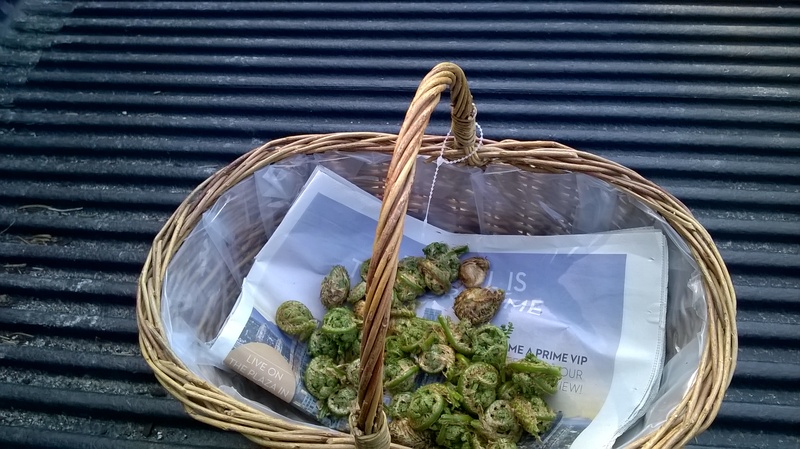 I think I will cook them up tonight and pass on the fiddle heads. What have I been doing? Finding Dragon Bones and Stinging Nettles. I am having a bit of writers block just now, or else it may be that because my laptop was in the shop for more than 6 weeks I have just got out of the habit of writing my blog. I have a writer friend who tells me that writing is like any job…you have to up each day, take a shower, get dressed, eat your breakfast, drive to your office, turn on the computer and sit down and start writing. Even if all you get out is one sentence a day’ the paragraph gets built, then the page followed by the chapter..
Its rare, Tom tells me, that the story or the poem gets created out there in the void between your grey cells. There is a process of creation that takes place on the paper in front of you. Like taking a piece of wood which you start to whittle away at. You take a bit off here, a bit there and soon it starts to resemble something, so to follow that lead. I am sure many of you have heard it said that many artists “visualize” the object in the chunk of rock or the piece of wood, and that all they are doing is removing the parts of the rock that obscure the object. Maybe, but I think it is as Tom says, you need discipline, and the more disciplined you are the easier it is to complete the task. I thin k it is similar to an exercise routine, if you keep at it, it sometimes seems effortless. However if you take a break from the routine, it always seems harder to get going again. That is kind of how I feel now, but the pattern is still there and the fingers are moving again and the thoughts are being laid down on the page. Here I go…. What have I been doing? 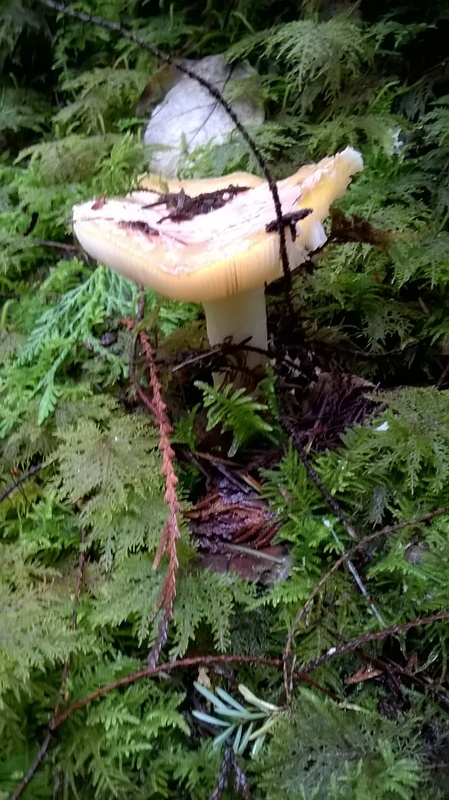 Well, I have been out there and have been seeing lots of fungi. Many are out lot earlier than usual, likely due to the incredibly mild winter we have had, Nice, but worrisome as there is almost no snow-pack and the woods are quite dry. We have had some very dry summers that last several years and two years ago we almost ran out of water. I am hoping for more regular and consistent rain over the summer and early fall. 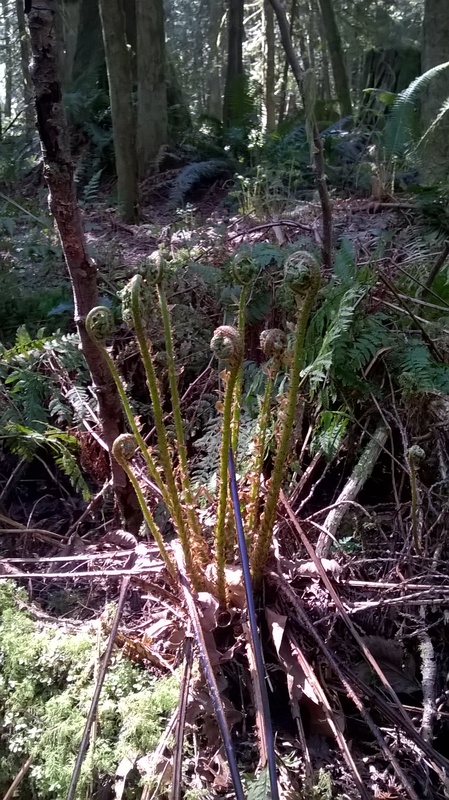 In February I went out on a walk ” ELF “(The Elphinstone Logging Focus) on one of their information hikes to raise the community awareness about the need to protect important and sensitive ecosystems. 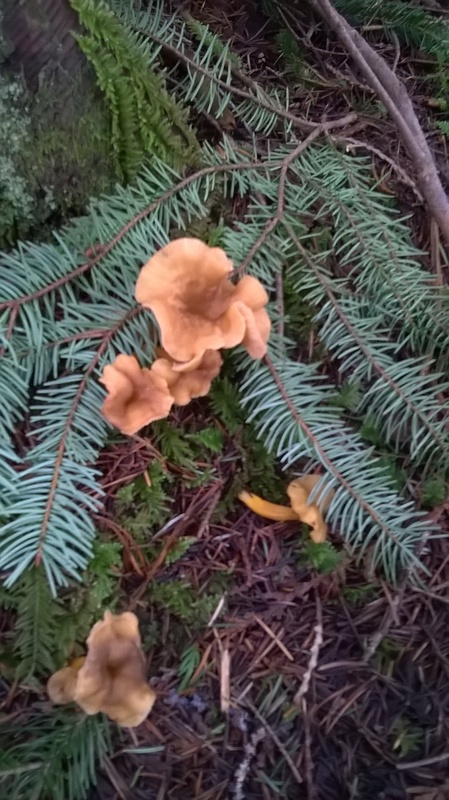 They took us up Dakota Ridge to are area of Forest that they called the Chanterelle Forest. It is part of the Wilson Creek water shed and has been slated for clear cutting. 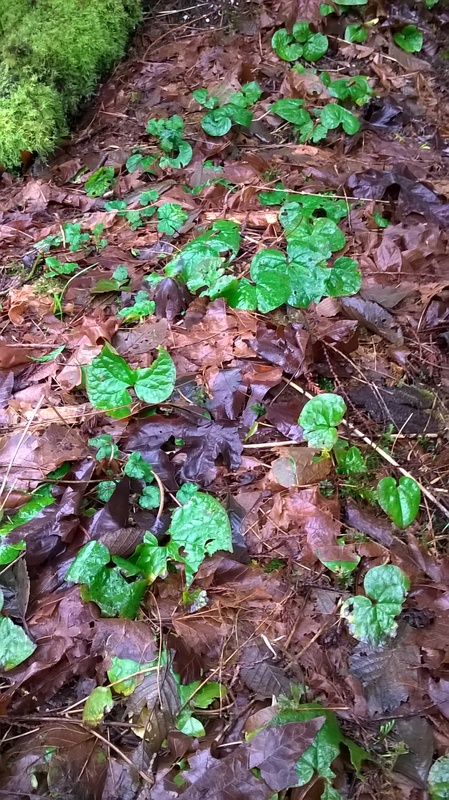 In February, a friend who is a wild forager, took us to her secret place in West Sechelt to show us where she picks her wild ginger and stinging nettle.. The first two images are of the ginger and the last one is the stinging nettle. The ginger is very aromatic and spicy which I dried and use to make a very nice warming tea. 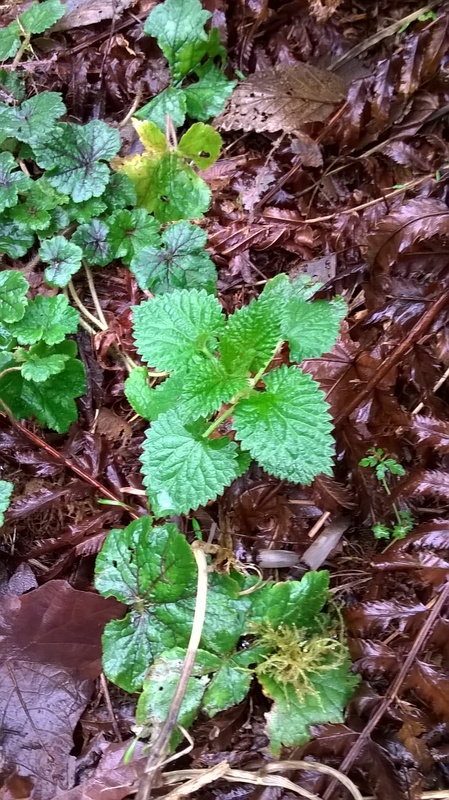 Nettles are also good for a spring tonic and can be made into a tea or even eaten. Cooking them in boiling water deactivates the compounds in the leaves that cause the sting. We took some small ones home to transplant so we didn’t need to trek way off into the bush to find some. We were sworn to secrecy to not reveal where this site was so don’t ask. I can tell you were down close to the inlet and that we saw may bones and clam shells strewn around. Upon closer examination the site looked like an old midden. The soil was incredibly black and just full of organic material strewn with clam and muscle shells. Made me think that this may have been a foraging site that the local first nations people had visited in the past. It also seemed to be an old homestead of some sort as well. 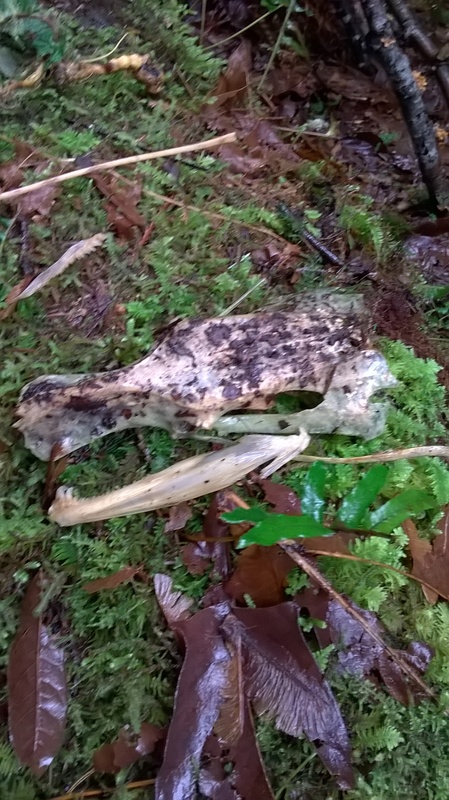 Here are some of the bones we found. 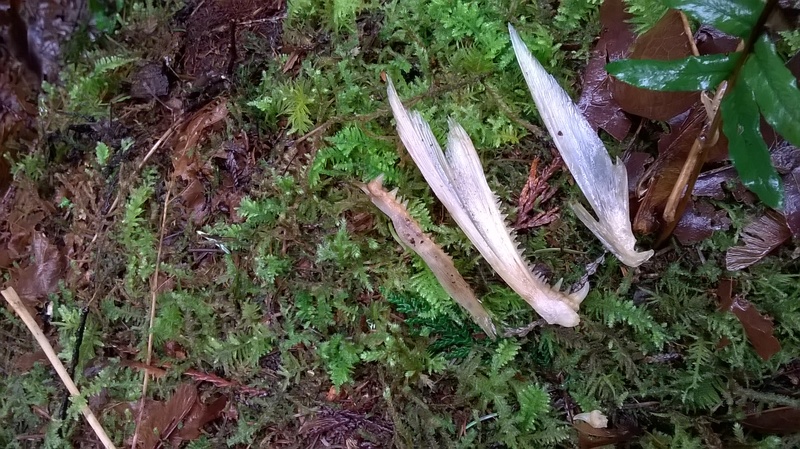 Many were salmon bones but some we could not identify. Especially the first two shots with the skull and jaw bones. Anyone have any idea what the skull bones at the top may be? I am calling them either dragon bones or sea-serpent bones. Let me know what you think they may be. We thought sturgeon; sea gull or even otter? When we did an on line search nothing seemed to match up . 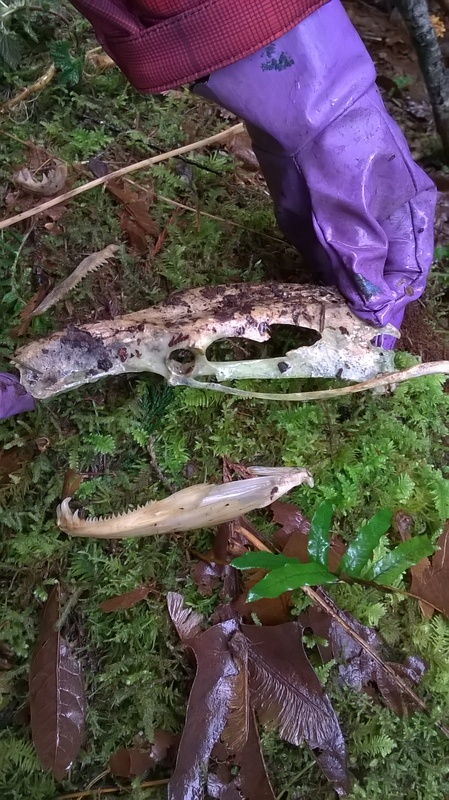 The others are definitely salmon bones and in particular, jaw bones of the salmon. 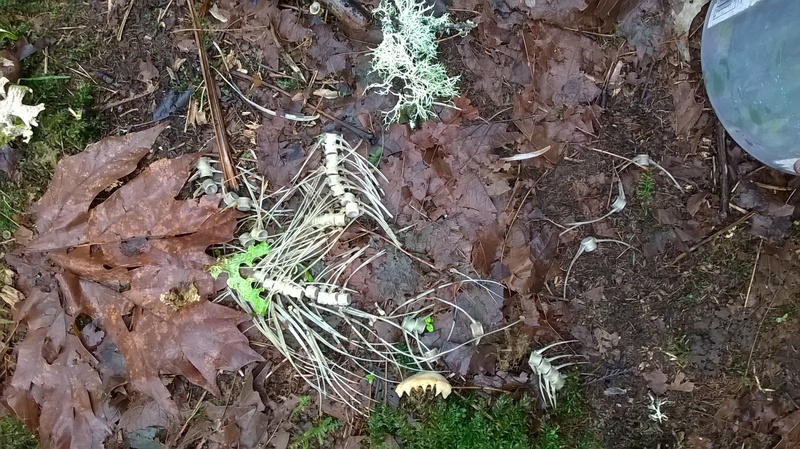 This is the first time I have seen the bones of fish up among the trees on the banks of the creek. There was a program I watched, The Nature of things, where the program talked about the importance of salmon to the health of the forest eco-system. The program was called The Salmon Forest. About how the salmon helps to fertilize the rain forests. The other exciting thing I did this winter was to go to a presentation about our local truffles and to accompany a truffle hunting dog, Dexter, on a truffle foray here on the coast. Dexter is puggle- pug-beagle cross. He found loads of truffles, although they were deer truffles and not the choice white or black Oregon truffles that we are suppose to have here. I have also had a couple of feeds of spring oyster mushrooms which again are very early as they usually start to flush at the end of April beginning of May. 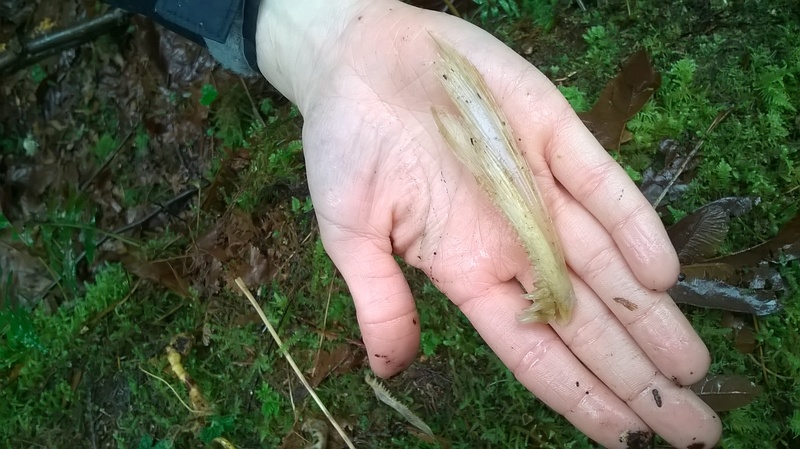 Take a walk along a creek with lots of alder and see if you can get a few yourself.